A new channel has started in DVB-S2 Clear: Al Jazeera HD (Qatar) on 12576.00MHz, pol.H SR:27500 FEC:3/4 SID:1601 PID:6011[MPEG-4]/6012 Arabic. A new channel has started in DVB-S2 Clear: Al Jazeera HD (Qatar) on 11045.00MHz, pol.H SR:27500 FEC:2/3 SID:10101 PID:601[MPEG-4]/810 Arabic. A new channel has started in DVB-S2 Clear: Al Jazeera HD (Qatar) on 12520.00MHz, pol.H SR:27500 FEC:2/3 SID:501 PID:601[MPEG-4] /810 Arabic. 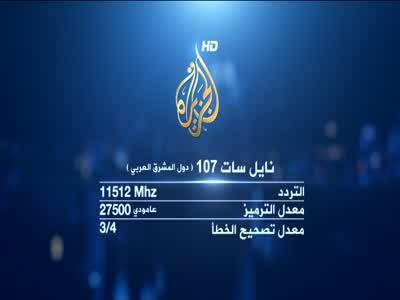 A new channel has started in DVB-S2 Clear: Al Jazeera HD (Qatar) on 12520.00MHz, pol.H SR:27500 FEC:2/3 SID:501 PID:601[MPEG-4]/810 Arabic. A new channel has started in DVB-S Clear: Al Jazeera HD (Qatar) on 11219.25MHz, pol.H SR:27500 FEC:5/6 SID:4301 PID:4301[MPEG-4] /4302 Arabic.